I recently found myself in the midst of a lively storytelling session with three of my nieces. Five-year-old Peyton told a tale of an evil witch who kidnapped a girl, holding her captive in a mountaintop castle. The story ended with a heroic rescue by the child’s parents as they steered a hot-air balloon up the dark side of the mountain. Kadance and Anabelle, three and two-years-old respectively, recounted the same story (although with a few missing plot-points, which they made up for with their unlimited enthusiasm). The experience reminded me of the timelessness of old stories (mythology, folk tales, and fairy tales) and it got me thinking about a collection of short stories I had stumbled upon recently–Please to See the King (view the: book trailer). For this collection, Kathleen S. Allen found inspiration in traditional English and Irish ballads and spun them into something completely fresh and entertaining. What first attracted you to English and Irish ballads? I was taking a class at Eastern Michigan University as part of the Master’s in Children’s Literature program called, Ballads, Legends and Folk Tales. I got the inspiration from the professor, Dr. G.B. Cross. He inspired me to write the stories based on ballads we had heard in class. I already knew many ballads because I sang and played English, Irish and Welsh ballads on my folk guitar since I was fifteen. 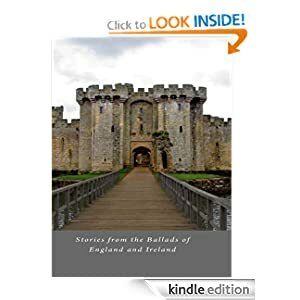 I’ve been fascinated with English/Irish history for ages. My great-grandmother was from Ireland. I originally wanted to include a CD with the book but I didn’t know anyone who could write an original arrangement for the ballads. At my book signing I did have my daughters, both gifted singers, sing some of the ballads. What were the challenges you faced in using old source material? I had to use versions that were in the Public Domain and got permission for using The Child Ballads from the publisher, Dover. Did you sometimes find it difficult to be original when using a well-known tale for inspiration? What books/websites do you recommend to writers who want to learn more about ballads? The English and Scottish Popular Ballads, 5 Volume Set . Lots of information in those! And Indiana University has a department on folklore.